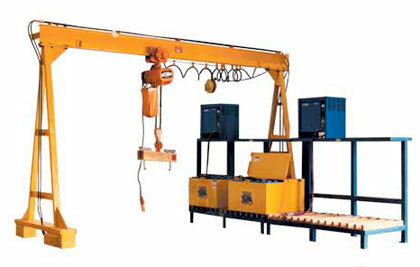 Our Powered Traveling “A” Frame eliminates the high cost of a Bridge Crane or a Jib Crane. Track mounted Hydraulic Powered wheels assure smooth travel. With controlled speed, batteries are easily and safely transferred from vehicle to a designated battery station. Built for continuous use, this rugged “A” Frame will give you years of safe, reliable services.